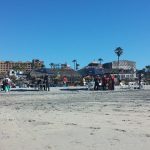 Did you know that Titanic was filmed in Rosarito, Mexico. Where is that exactly? It’s a town located in Baja California, which was separated from the mainland back in 1773 with a crucifix on a pile of stones in the Rosarito valley. The land was native to Kumiai Indians and sadly what happens to most native lands, the settlers and missionaries made it their home. 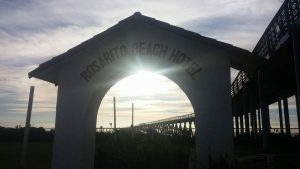 By the 1920’s Hotel Rosarito opened along the beach attracting tourists like ranching families arriving from California. Now in the millennia Andrew thought it would be a great road trip for us to take to fall madly back in love. What happened instead was an instant love affair with tequila. I mean its Mexico, right? 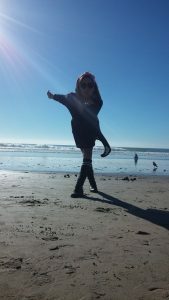 Flashback to our time in California which was both my favorite and least favorite time of my life. I was a twenty something year old gal living out of the house for the first time with my “now fiancé”. Could anything go more wrong? 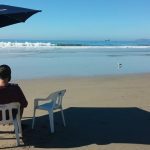 Our trip to Rosarito was a Christmas gift. We were on a rocky path and Andrew figured it would put the stones back into place. The drive itself was absolutely beautiful. If you have never been to California, then you are missing out. The entire reason for that states existence is to explore as far as your car can take you. Our car drove us right over the Tijuana border, scary as first but hey if you’re going to call yourself a Californian you got to take the risk! That was my first experience in the country outside of a resort, and it really isn’t what the news reports. I was expecting bodies hanging from bridges or does that only happen in Queen of the South? Upon our arrival to the city, we ordered some tacos, the traditional way (cilantro & onions), and added some guacamole like true Americans. 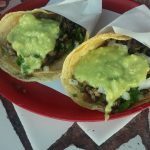 Since it’s a tourist spot I won’t judge their cuisine but I had better tacos in the hoods of Ventura than I did in Rosarito. Just saying! Also as tough as Andrew is, he refused to venture off of the beach area where the real good food is! So to the beach we go! At the beach you are totally bombarded with tons of guys trying to lure you into their restaurants. 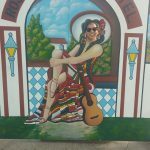 I felt like a sailor whose ship was about to get wrecked by a Mexican Siren. Andrew made a deal with one of the guys, if they were willing to move the table all the way to the ocean we would eat there. Not even two seconds flat we found ourselves with drinks and nachos (by far best ones I’ve ever had) in our own made up sand bar. Like no-one else was doing this! Only Andrew, I tell you! By the time lunch was over we were a tequila bottle in (because they dumped it down our throats) and onto Papas & Beers which I heard was the spot to be at, except it was winter and it wasn’t as popping but still fun, we were supposed to make it back out but I passed out in the shower naked, which is my usual drinking debacle situation. 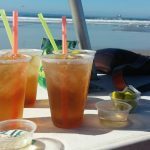 Oh if I didn’t mention this before, we had a group on deal to stay at the oldest hotel Rosarito Beach Hotel, which included a spa date. The hotel is kind of cute with a great view of the ocean and the spa is similar to a mafia style bathhouse. This was back in 2015, so I am not quite sure if things have changed, but it is totally worth sleeping in a piece of history. After our relaxing massage we took to the beach one last time before our drive back home. 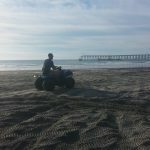 These ATVs found their way under our legs riding dirty on the beach. It was so much fun! Tequila aside this was the best part of the trip. Competition helps put the fire back into a dim lit romance. It was time to take our hot new romance back to Camarillo where we hoped it would stay alive. Alive is all we wanted to be as we drove back through the favelas of Mexico. 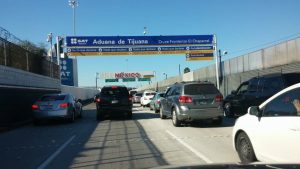 We followed the signs to the border but ended up lost in Tijuana. Randos were walking up to the car to wash it and Andrew just kept racing through red lights trying to avoid them. The kid in me wanted to let them wash the car maybe they need the cash. Andrew being a responsible adult knew we needed to get the F out of there before any kidnapping occurred. (Just kidding, Mexico) All those fast and furious activities led us right into the SENTRI lane without a pass. SO what happens when you pull up to border patrol in the wrong lane, you ask? You get stuck at customs for four hours so that your car can get inspected with cute but vicious dogs. [side note, if that happens more than three times they make you pay a fine and tow your car] It was definitely the long way home. Like who does that? OH that’s right, us! Although what is a vacation without a minor hiccup, boring! After explaining to the guy that it was an honest mistake we headed back home to our average “tequilaless” life! Bro I wish I had been there what a scene ! Passed out in the shower dude that sounded like such a Blast!